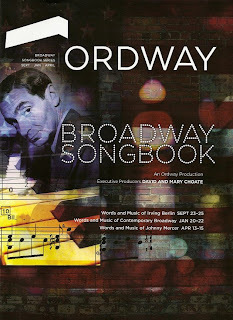 The Ordway is presenting a series of informal cabaret-style concerts this season called Broadway Songbook. 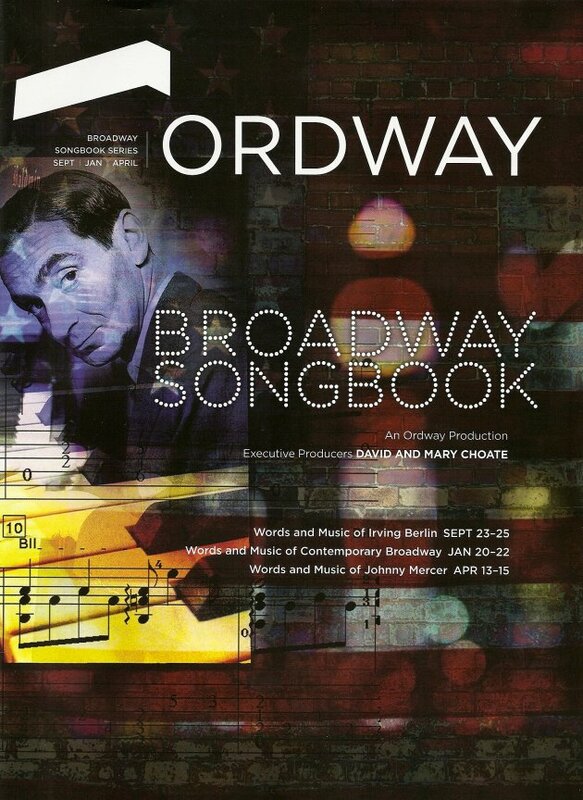 The first one featured the music of Irving Berlin, and was an entertaining and informative look at the history of musical theater. The second installment, featuring music of "Contemporary Broadway," was the one I was most looking forward to, and I thoroughly enjoyed it. It was a fairly accurate representation of the state of Broadway today - the good (The Book of Mormon), the bad (Priscilla Queen of the Desert), and the ugly (Spiderman: Turn Off the Dark). I'm not a big fan of jukebox musicals or adaptations of blockbuster movies; it seems like an easy way for producers to make money without taking any risks. But that's a lot of what's popular on Broadway these days, so it's only fair that they included it in this show. Fortunately there were also plenty of original musicals and revivals featured to balance things out. The host for the series is Ordway Artistic Director James Rocco, and once again he introduced each song with a little background or a funny story about the show or composer. Accompanied by Raymond Berg on piano, the talented singer/actors included Joel Liestman, Robb McKindles (both of whom also appeared in the Irving Berlin show last fall), Kym Chambers Otto, Allison Tilsen-Kassabian, and Cinderella herself, Jessica Fredrickson. The opening number was a beautiful, soaring song that I was unfamiliar with (and I thought I'd know all the songs! ), from a musical called Songs for a New World by Jason Robert Brown. Jessica sang several musical theater songs that always get me teary-eyed. "The Beauty Is" from Light in the Piazza by Adam Guettel, "There's a Fine Fine Line" from Avenue Q, "For Good" from Wicked (a duet with Kym), "Supercalifragilisticexpialidocious" from Mary Poppins. OK maybe that last one doesn't quite fit with the others, but she was definitely channeling Julie Andrews! James announced that Jessica will soon be moving to New York City. I'll be sad not to see her on local stages, but I wish her well and hope to see her on Broadway one day! In addition to the duet with Jessica, Kym sang the beautiful ballad "I Get a Kick Out of You" from Anything Goes, currently running on Broadway (and I'm kicking myself for not seeing it when I was there last fall - sadly I can only fit so many shows into 5 days in NYC). She also led the cast in "Day by Day," the 1970s pop hit from the musical Godspell, also currently being revived on Broadway. Two of the shows I did see on Broadway last year (and adored) were featured in the show. Joel sincerely and hilariously sang "I Believe" from the brilliant original musical by the creators of South Park, The Book of Mormon (there are only a few songs from that show that you can sing at the Ordway on a Sunday afternoon), and James himself sang the classic "Broadway Baby" from the divine revival of Stephen Sondheim's Follies. A newbie to the Twin Cities theater scene, Allison has a fabulous voice and personality to match. She got one of the biggest rounds of applause for her rendition of "When You're Good to Mama" from Chicago, and closed the first act on a high with "I Will Survive" from Priscilla Queen of the Desert, which I earlier referred to as "the bad" because: 1) it's a movie adaptation, 2) it has no original music, and 3) they use some canned music instead of a full live orchestra. That's three strikes and you're out in my book. But despite the origins of the song, it was still a fabulous rendition of a classic pop song. Joel and Robb made for an entertaining Pumbaa and Timon in the super fun song "Hakuna Matata" from The Lion King. Too bad they didn't also sing this song's counterpart from The Book of Mormon, "Hasa Diga Eebowai." Oh wait, that's one of those songs you can't sing at the Ordway on a Sunday afternoon. Slight digression: I've been seeing the ads for The Lion King everywhere, but I will not be seeing it. Don't get me wrong, I've seen the show several times and love it. It's that great familiar music from the movie but with a much richer and deeper orchestration, and the puppets/masks are truly a sight to behold. But for the price they're charging for tickets ($100+ for just about every seat in the house), I can see 2-3 local shows that are just as good, if not as splashy. So I'm choosing to spend my time, money, and blog space on supporting local artists and new work. Joel sang the beautiful and dramatic song "Music of the Night" from Phantom of the Opera, a show I'm proud to say I've never seen (I seem to be the only person on the planet who hasn't). He also sat down at the piano to channel Billy Joel in the title song from the jukebox musical Movin' Out (which I have also never seen and don't plan to). Robb and the cast sang "Steal Your Rock and Roll" from the Tony award winning musical Memphis, a show I am looking forward to seeing on tour at the Ordway in a few months. He also sang one of my favorite songs from Jersey Boys, "Can't Take My Eyes Off of You." I know I said I'm not a fan of jukebox musicals, but Jersey Boys is the exception that proves the rule. I've seen it twice and I love it. I think the reason it works for me is that the book is really clever; it's the true story of The Four Seasons' rise to fame (and subsequent fall), not some silly story made up to fit into the body of songs. Finally, you can't really talk about contemporary Broadway without at least mentioning the spectacle that is Spiderman: Turn Off the Dark (aka "the ugly"). James gave a brief history of all the trials and tribulations (and expense and injuries) the show has gone through, describing the songs as guitar-heavy Bono songs. "Let's do a song... no, let's not do a song from the show." Wise choice! It was another great afternoon of exploring the world of musical theater at the Ordway. The only shows I thought were missing were two of my recent faves - Next to Normal and Spring Awakening (Bloody Bloody Andrew Jackson is probably too much to hope for). But other than these two absences, it was a truly wonderful selection of the best of Broadway, performed by some fantastically talented local actors, singers, and musicians. Next up: the music of Johnny Mercer.